This billboard from SAFE popped up near work the other day. Normally I’m irritated by this organisation, which collects money from the public but doesn’t seem to do much for animal welfare. This poster is fairly standard SAFE hyperbole. Where did they get those numbers from? And don’t they know shotguns aren’t usually equipped with telescopic sights? In years past I’ve been fairly dismissive of this kind of criticism but there’s no doubt that a fair chunk of the population is becoming less tolerant of pastimes like duck shooting (where did “duck hunting” come from?). And there’s no denying that a good many ducks are left painfully injured or don’t have an especially quick death. 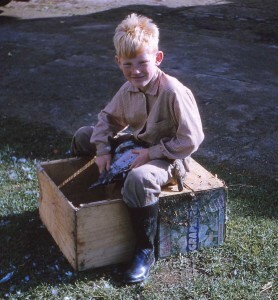 I grew up with duckshooting. Until I was old enough to weild a shotgun – about 12 or 13 – I would avidly follow my father around as we stalked the various farm dams, usually coming home with a few ducks that I would be left to pluck. It was a bit of a chore, but I did enjoy the last part where we singed the plucked carcasses. I was never a great shooter but I usually managed to bag a couple, first with our little single-barrel .410 shotgun and then with a rather elderly Damascus-barrel side-by-side shotgun that probably presented a greater risk to me than my prey. 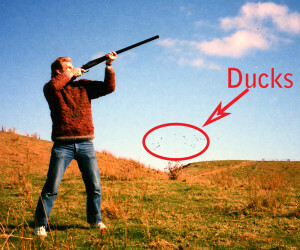 My father surprised and disappointed me one day when he admitted he didn’t particularly enjoy shooting ducks any more. I was about 15 and still bloodthirsty for small game around the farm – rabbits, hares, possums, ducks and the occasional turkey. He was in his late 40s, becoming more reflective and starting to realise that wild animals are more than just a problem to be solved. After my parents sold their farm my opportunities for shooting pretty much disappeared. My last outing was on my cousin’s farm in the late 80s where he, my father and I did the rounds of the dams. We got half a dozen or so between us, plus an unfortunate turkey that got in our way during a quiet part of the day. It was nice to relive old times with family but it didn’t leave any of us hankering for more. These days I find myself on the fence when it comes to the rights and wrongs of hunting. Neither side of the debate cover themselves with glory. The animal rights advocates have little understanding of the positive side of hunting – the skills learned, the enjoyment of passing traditions down the generations, the appreciation of the outdoors and of course the opportunity for a good feed if all goes well. And the hunting and fishing lobby are often both aggressive and overly defensive, lashing out at anybody or anything that might stop them exercising their birthright. They each talk past each other. From on top of the fence, I have sympathy for both sides – to a point. I’d like those SAFE people with their fluffy rabbit costumes on street collection days to realise that humans and animals have a long, complex history that includes a predator/prey relationship that’s present in all cultures. Hunting is no longer necessary for our survival but the instinct is still hard wired into most of us. And I’d like the guys with the camo gear to realise that what they do is a privilege, not a right – to respect not only their opponents’ viewpoint but also the welfare of the birds and animals in their sights.